This page aim to provide a general introduction on the traditional Indian musical institution called gharana. Indian Classical music can be described a religion whereby the music, knowledge and musical research was traditionally passed down from guru to disciple by word of mouth. In many old musical families the guru or teacher, is the father and the disciple or student, the son. A gharana, or musical dynasty is formed when this process of teaching is passed down for five or six generations. There are two types of gharana in India, direct gharanas in which music has remained within a family and indirect gharanas, where in the absence of sons or musically talented sons, the teacher chooses to pass on his knowledge to a talented student. In India there are very few direct or true gharanas left. Students will find here few articles written by renowned specialists in the field of Indian classical music. Indian Classical music can be described a religion whereby the music, knowledge and musical research was traditionally passed down from guru to disciple by word of mouth. In many old musical families the guru or teacher, is the father and the disciple or student, the son. 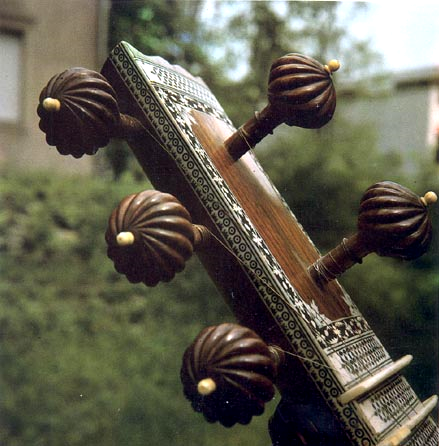 A Gharana, or Musical Dynasty is formed when this process of teaching is passed down for five or six generations. There are two types of gharana in India, direct gharanas in which music has remained within a family and indirect gharanas, where in the absence of sons or musically talented sons, the teacher chooses to pass on his knowledge to a talented student. In India there are very few direct or true gharanas left. Ustad Imrat Khanâ€™s Etawa Gharana is one of them. The Chakrabarti family of Kotalipara, Faridpur, East Bengal, is believed to be the pursuers of art, culture and education from the ancient times. The musical tradition starts glooming when one of the ancestors of the family was introduced to Vishnupur Gharana (school), and achieved prominence. Biswabrata’s great grandfather Late Kulachandra Chakraborty and his brother Late Pandit Ramchandra Chakraborty had their training from Ustad Jahur Khan of Khurja Gharana (school). Ramchandra had the honour of being the court musician and scholar at the court of Maharaja of Natore. Thus both the brothers had a wide contact with many leading musicians of their time, and had a phenomenal collection of musical wealth. Having moved to Kolkata (Calcutta) with his rich musical wealth, Biswabrata’s grandfather, son of Kulachandra, the great legend Late Sangitacharya Tarapada Chakraborty started taking his lessons from the Maestro Late Pandit Satkari Malakar, especially in Kheyal and Tappa and later under the guidance of the Maestro Late Pandit Girijasankar Chakraborty. Tarapada Chakraborty acquired and explored the distinguished features of different Ragas and styles, traditional Dhrupad, Dhamar and Kheyal bandish of different Gharanas (schools) like Vishnupur, Betia, Gwalior, Seni, Rampur, Delhi, Agra, Rangila, Jaipur and Kirana. Pandit Girijasankar being a pioneer of Thumri style at that time gave Tarapada Chakraborty an intensive training on the Thumri style of Benaras and Kirana Gharana (school) as well. But apart from the training he received, it is quite discerningly evident that Kheyal and Thumri received a rare authentic character and completeness in the heralding Gayaki (style) of Tarapada Chakraborty in its own way. His brother late Pandit Haripada Chakraborty had a golden voice and took training from his ancestors as well as Tarapada Chakraborty. The next generation of great musicians of the family, Pandit Bimalendu Chakrabarty, Pandit Manas Chakraborty and Srimati Sreela Bandopadhyaya got their training from Sangitacharya Tarapada Chakraborty. They are carrying onward the legacy of this great tradition with their own distinguishable marks and adding new treasures everyday to enrich it. Biswabrata is the present generation of this great tradition. He was introduced to classical music by his grandfather, the legend Tarapada Chakraborty, in his early childhood. He started vocal training under his guidance; later on he was guided by his father, Pandit Bimalendu Chakraborty, uncle, Pandit Manas Chakraborty and aunt, Srimati Sreela Bandopadhyaya. He also studied tabla under the guidance of Pandit Basudev Mukherjee a disciple of Ustad Keramatulla Khan. In the age of twelve years he was introduced to Sitar by his mother, Late Srimati Meena Chakraborty who was a fine Sitarist and was the student of Sitarist Pandit Santosh Bandopadhyaya, the disciple of Ustad Dabir Khan of Seni Gharana (school). He took his early lessons from his mother and Santosh Bandopadhyaya. Later on he started taking lessons from the Sitarist Pandit Ajoy Sinha Roy, the disciple of legendary Ustad Allauddin Khan and his son Ustad Ali Akbar Khan. In this period Biswabrata explored the styles and applications of these two great Gharanas (schools). But his father Pandit Bimalendu Chakrabarty consistently trained him and played a great role in the formation of this unique style what he is playing now. He was also deeply inspired by the experimental approach of his uncle Pandit Manas Chakraborty, who’s constant training & guidance is invaluable in his making. Apart from inheriting the huge wide range of colours of his own ancestors, Biswabrata adopted and assembled the styles of other instrumental Gharanas (schools) to create a unique style of his own and started a new instrumental tradition within his own family tradition. It could be said that he is a sitarist with a soul of a vocalist and he lifts the instrument to the nearest of the vocal essence of Indian classical music. Apart from the philosophy and depth he is also gifted with phenomenal skill, which is easily traced in his Taans, Gamak, Meer etc. played in difficult vocal approach. In this long journey since childhood, in the making of a musician to an artist, he has undergone a number of changes in terms of technicality, philosophy and spiritualism, which is an indication of his experimental & perfectionist nature. The aesthetic sense he is gifted with, helps to present his music with the vision of a poet. The depth and the philosophy within helps to represent a new sound and at the same time the deepest spiritualism with rare antique emotions. The musical heritage of Kotali gharana (the schooling) emerges from a unique historical background, that spans beyond a millennium. At that time King Chandra Burma used to rule over a wide area of southwest Bengal during the reign of emperor Samudragupta. Kotalipara in the Faridpur Zilla of East Bengal (presently Bangladesh) owes its origin to “Chandraburmankot”, erected circa 315 AD, the remains of which are still extant. “Kot” stands for fort, “Ali” signifies “wall and area surrounding the fort”, and “para” means a settlement or “a neighbourhood”. Kotalipara was known as the second ‘Naimisharanya’ of India. It was inhabited predominantly by the Brahmins and was like a hermitage fostering advancement of the Sanskritic culture and philosophy in its various aspects. In the beginning there was a dearth of Sagnik Brahmins in this region. In 1019 AD Shyamal Burma (or Samal Burma), the king of this region invited Yashodhar Mishra, the son of Maheedhar Mishra of Kanyakubja and gave him 14 villages to settle down. In the following period on Shyamal Burma’s request Yashodhar Mishra brought thirteen more Sgnik Brahmins from Kanauj. According to the “Vaidik Kuladeepika” Yashodhar Mishra retained Kotalipara, Samantasar and Chandradweep in his own account and settled there with some Brahmins of other Gotras. He distributed the other villages among the rest of the Brahmins to settle down. He gave him fourteen villages for settling down. As far as history is concerned he retained Kotalipara for himself and settled down there. Gradually Kotalipara became a nucleus of musical and other cultural practices. Harihar Mishra, the 18th generation of Maheedhar Mishra received the title “Chakraborty” on performing the “Goshthipati Yag”. Various forms of music have been practised in this gharana from ancient times. Vaidik samgan, Marga/Natyageeti [Magadhi, Ardhamagadhee, Sambhaavita, Prithula and Dhruva] Prabandhageeti and many other kinds of ‘geet’ were in vogue. Later Biswambhar Chakraborty, a descendant of Harihar Chakraborty came in touch with the famous Veenkar and Rabaab player of his time, Saadik Ali Khan, son of the renowned Zafar Khan, a direct descendant of Tansen. Biswambhar learnt some dhrupad ‘Bandishes’ and ‘alaap’ as well as some Khayal bandishes through his association with Saadik, his nephew, Kasim Ali Khan and his disciple, Ganesh Vajpeyee [Source: Kalidas Chakraborty, son of Nyayaratna Ramchandra Chakraborty]. Since Biswambhar Chakraborty was directly involved with the mainstream Hindustani classical music he was naturally drawn to Dhrupad and Khayal. A near contemporary of Bishwambhar Chakraborty and a descendant from another stream of this large family Taraprasanna Chakraborty became a disciple of Jadubhatta of the Bishnupur gharana. The two streams of Seni and Bishnupur gharana from these two sources were carried forward through Biswambhar’s son Sheetalchandra Chakraborty, and his sons Ramachandra (Nyayaratna) and Kulachandra. Ramachandra (Nyayaratna) during his official sojourn in Berili received Taalim from Jahur Khan of Khurja gharana. Jahur Khan in turn took lessons in Sanskrit from Ramchandra. Kulachandra too joined these musical sessions for a short time. 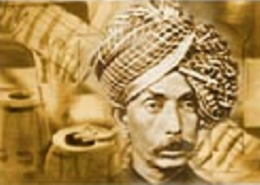 Nyayaratna Ramachandra Chakraborty was the Dwar Pandit (court scholar) and a court singer at the state of Natore. Kulachandra had three sons the younger two being Tarapada Chakraborty and Haripada Chakraborty. Their elder brother died at a very early age. Tarapada’s preliminary training was under his father and uncle. Later he came to Calcutta and received ‘taalim’ from Satkari Malakar, a pre-eminent exponent of the Gwaliar gharana. Finally he received taalim from Girija Shankar Chakraborty who was trained in various gharanas like Betia, Rampur, Jaipur, Seni, Banaras, Kirana, Agra, Delhi, and so on. In his sheer individual endeavour Tarapada earned many musical treasures which adding to his ancestor’s collection created a huge musical treasure trove. There were dhrupad, dhamar, khayal, tappa, thumri and other semi classical musical forms in this collection. Alongside he practiced various folk music and Keertan, which can be considered as a form of classical tradition unique to Bengal. His individual and ethereal style has etched a unique place for him in the realm of Hindustani Classical music. Sangeetacharya Tarapada Chakraborty became a legend in his lifetime. In truth he is the prime architect of the Kotali Gharana. Pandit Manas Chakraborty, the son and disciple of Sangeetacharya Tarapada Chakraborty is a living legend in the realm of Hindustani Classical Music. With his multifaceted talent, creativity, intellectuality and philosophical views and research on other classical Gayaki of musical traditions, semi classical and folk-forms of India, in alliance with his own tradition opened a new vista in the Kotali gayaki. The Kotali gharana was named after the name of the place of its origin in the phase following 2000 by him in accordance with his father’s wish. Gaan Saraswati Shreela Bandyopdhyay, an able disciple and the eldest daughter of Sangeetacharaya Tarapada Chakraborty received training under her elder brother Manas Chakraborty too. She established herself as an outstanding vocalist of the Kotali Gharana. Haripada Chazkraborty and his elder son Bimalendu Chakraborty also received Taalim under Sangeetacharya Tarapada Chakraborty. Evidently Manas and Shreela were the prime ambassadors of this gharana who with their recitals kindled the light, essence and the multidimensional gayaki of this gharana in other parts of the world. Currently the vocal and instrumental artistes of this gharana are widely appreciated and established at home and abroad. Ruchira Panda , an outstanding vocalist and one of the senior disciples of Pandit Manas Chakraborty groomed in the Kotali gharana has earned an enviable distinction amongst the younger musicians in the realm of Hindustani Classical Music. Her gayaki speaks out for her keen interest in aesthetics, spiritual awareness and serenity which is seldom found in modern days. She carefully keeps up with the purity and nuances of the Kotali Gharana aligning with the multifarious gayaki of her Guru and his predecessors. Kotali Gharana’s musical heritage was deep rooted in history. It goes nearly a thousand years back. Or maybe even more. At the times of Samrat Samudragupta, Raja Chandrabarma used to rule over a vast territory in south-western Bengal. He built a fort and named it Chandrabarmakot. It is believed that the year was 315 AD. It was a settlement of Sagnik Brahmins and became famous as a centre of cultural learning especially music. However due to natural calamities, the community didn’t survive or migrated and the fort became derelict and it was reduced to ruins. Several hundred years later and about 1019 AD, the ruler of the land Raja Shyamal Barma directed Jasodhar Misra, the son of Mahidhar Misra to establish a community which was set up around the ruins of the fort and this was christened as Kotalipara (kot = fort, ali = the wall and the land encircling the fort, para = neighbourhood). Later on Jasodhar Misra invited 13 Sagnik Brahmin families to settle in Kotalipara. Soon it was re-established as a centre of musical learning. Eighteen generations after Mahidhar Misra, Harihar Misra earned the title ‘Chakraborty’. Tarapada was the twentyninth generation of this Chakraborty family. His father Kulachandra and uncle Ramchandra were students of Zahur Khan of Khurja gharana. Naturally, young Tarapada learned his ropes from these two skilful exponents of Hindustani music. Later in life, he came to Calcutta and received talim from Satkari Malakar of Gwalior and Benaras gharana. His last Guru was Girijasankar Chakraborty who himself was a treasure house and melting pot of many well known gharanas like Kirana, Agra and Jaipur. But the mark of the true artist is originality. Tarapada’s music education was not limited to what he learned from his gurus; he ranged far and wide, dived deep and flew high wherever music would lead him to. Thumri, dhrupad, dhamar, tappa were just a few of his seemingly endless repertoire of musical skills. His originality was an indication of the variety and richness of Hindustani classical music. As years went by, Tarapada’s creativity came out of its shell. The distinct nuances that are not so easy to shed and those that bear the mark of a guru and the gharana were gone and were replaced by a style so rich and original that very soon he was able to establish himself as a supreme artist recognized for his unique presentation. Baba Alauddin Khan was deeply impressed by Tarapada’s music as indicated in one of his letters. Ustad Fayaj Khan said in an interview aired from Lucknow Radio Station that Tarapada was in his list of top three khayalists. Tarapada also enjoyed the popularity of the people. 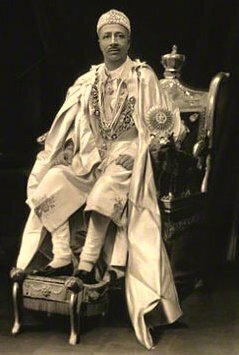 He made his mark at an early age of 20, in the year 1929 at the Albert Hall in Calcutta. In the early thirties, he started his career as radio artist but curiously as a tabla player with the recommendation of Raichand Baral. Talent needs a break and Tarapada got his break one evening when the vocalist Jnan Goswami was absent and Raichand Baral asked him to take his place. After that Tarapada did not have to look back. His popularity spread like wildfire throughout India. 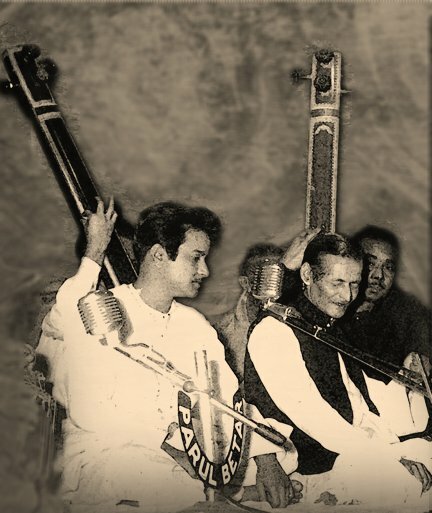 He started performing for national radio programs and prestigious music conferences with renowned artists like Abdul Karim Khan, Fayaz Khan, Mazaffar Khan, Baba Alauddin Khan, Hafiz Ali Khan, Onkarnath, Ananth Manohar Joshi, Kesarbai, Hirabai, Roshanara Begum, Bade Gulam Ali Khan and many others. Tarapada was the originator of Bengali khayal, which was just yet another instance of his creativity. There was something different in the way he used sing classical based Bengali songs. It was as different was it was remarkable. It was original. Tarapada, a maverick, named the style he evolved as the Kotali gharana and thus permanently established a musical heritage that goes back more than 15 centuries to the days of Emperor Samudragupta. His son, Manas Chakraborty kept this heritage alive. Manas Chakraborty, the devout pursuer of various sources and streams of Indian Classical Music is enriched by his keen interest in Indian Philosophical traditions of all the existing Gharanas and Gayakies. The musical phenomenon of Manas has attained a new altitude which is his very own and individual and has initiated a new dynamics of allegiance to the human efforts towards life and its values. He sets his Khayal Gayaki in accordance with the character of Raga. Gifted with deep sonorous and vibrant voice when he enters the actual territory of the Raga with bandish-gayan and vistaar he uses the method of modal variation of inflection of several notes for the particular ‘Ras’ demands. With ‘Kakuswara’ prayog and also various other suggestively rich ‘meend’(glides), ‘Kan’,‘Khatka’ and by some rare applications of meer-khand process he builds up an aesthetic edifice with his majestic mizaaj and serenity. His innovative and intricate Bahalwa and sargam structures create bridge of transition between the mid-phases of Gayaki of his vistaar and taan. Finally he makes deep into the complex area of taan with thundering gamaks and halaks, culminating in kut, jamjama, sapat and other patterns with such an amazing ease in gradual speeds in extempore that at the very juncture of penetration while rendering in tremendous speed he practically captivates the audience in a state of climatic anxiety. The Maestro boldly makes the manifold moves of his style to achieve an integrated oneness of the eternal Indian ethos, to enrich the dimensions of a particular raga. His Thumris have created a landmark in the evolution of Hindustani-Music. The abstract soul of the Artist comes out with musical expressions by bol-banana and unfolds his fecund mind with delicacy in his delineation. Although, he was initiated in lachao and Banarasi Thumris by his father he is not at all orthodox and has accepted improvisations and fusions with the Punjabi style and some folk elements in his thumri gayan. In his thumri gayaki one can notice the evolution of styles that has come through the ages and reached an ensemblic height in his style with lyrical values and poetic sensibilities of his own. Manas is a versatile genius who has unsurpassed mastery of all languages of Khayal, Thumri and various other semi-classical styles of music such as Tappa, Bhajan, Ragpradhan etc. Most of his own created bandishes can be noted by his pseudonym ‘Sadasant’ and he is distinctively adored among the music-lovers while rendering these for his emotional expression essentially romantic, with a great control over his voice with which he can pass-over whatever message he likes to attribute. Manas’s musical journey started at the tender age of seven along with his illustrious father participating in several conferences. He distinctly remembers the metamorphic initiation as he recalls his performance at the All India Music Conference, at Roxy Cinema Hall, Calcutta around the age of twelve. His astonishing maturity at that age attracted spontaneous praises even from the great exponents of classical music like Ustad Alauddin Khan, Sreemati Kesharbai Kerkar, Pt. Omkarnath Thakur and of course Narayan Rao Vyas who used to affectionately call him the ‘Little Tiger’. Since then he had never looked back, his recitals have earned an enviable distinction as an’ “Artist of Artists ”, in various concerts in both at home and abroad. ‘Talim’, ‘tabiat’ and ‘taiari’ with inborn artistry, profound knowledge, intellectuality and cerebral ability has given a new dimension to his unique style of rendition which is now being followed by many artists along with his own disciples. Thus presenting the obscure reality of music in a tangibly graceful elocutionary form with his kalabant gayaki, nayaki and majestic mizaaj has made him an institution by himself in the international realm of Hindustani Shastriya Sangeet. His contribution towards the Hindustani Classical Music for the last fifty years is undoubtedly worth-mentioning and as a ‘Guru’ he is great. The schooling of Indian Classical Music through the mentors of his family and the torchbearers, established around the globe has already entered the seventh- generation and now the new trend of ‘Kotali Gayaki’ is his single handed orchestration, which with the synthesis of diversities has finally created and defined the ultimate shape of ‘ Kotali Gayaki’. His highly technical and eclectic approach though different from his father’s individuality, is finally convergent to the philosophical end of the essence of ‘Kotali Gharana’. During the past two decades, when music conferences became very popular, every musical artist proclaimed that he came front a particular famous Gharana, that is, a particular line of hereditary musical tradition and particular school of musical styles created or followed by great music teachers and their disciples.